In the last article we explored our underlying game design philosophy, or “mantras”, behind the tactical combat and set out the goals we wanted to achieve. Now lets see what mechanics we came up with. Bear in mind that at this early stage everything is still subject to change. The combat already works fine, is fun and offers a wealth of tactical options the way it is – but that doesn’t mean we won’t improve on it as we continue to develop the game. 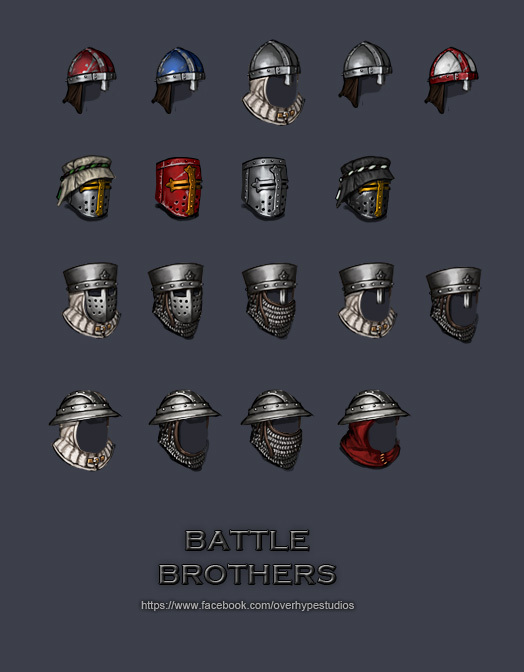 All characters, Battle Brothers and enemies alike, have distinct character stats which heavily influence their performance in combat. 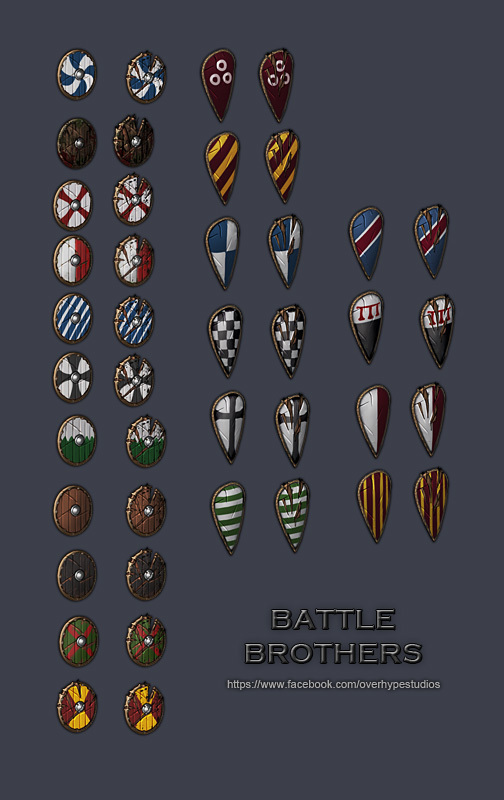 If you haven’t already, you should read our earlier article about character stats (http://battlebrothersgame.com/character-stats/) prior to this one. 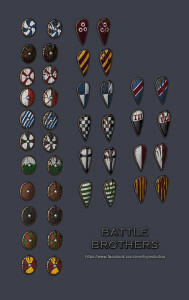 Battle Brothers uses an initiative-based system to determine the order in which combatants can act out their turns. There are no separate turns for the player and the AI to move all their characters at once, such as, for example, in Jagged Alliance. Instead, all characters, whether player or AI controlled, are sorted by their initiative and act in descending order, one after another. Initiative is calculated each round based on a character’s action points, their accumulated fatigue and the type of armor worn. Characters that are slower, more fatigued or wearing heavier armor generally act later in a round than those that are quick, fresh and lightly armored. Being able to land the first strike can be a big advantage in a combat situation, as you can imagine, so it can pay off to have some of your Battle Brothers equipped with light armor even later in the game. We decided to go with an initiative-based system like this because we felt that this better conveyed the feeling of a frantic and dynamic close combat than neatly separated turns would. At the start of a tactical battle, most of the map is covered in black and needs exploring. Characters have a limited view range, which is influenced by obstacles blocking line of sight, the level of elevation that the character is on and the type of helmet worn. While the player is able to see what all Battle Brothers are seeing, the individual Battle Brothers are still sometimes limited by what they personally can see. For example, to be able to make an aimed shot, the respective Battle Brother has to have a clear line of sight to his target. Hexes that aren’t currently visible to any Battle Brother are covered in the Fog of War (seen as grey and desaturated, as is common). The player can still see the terrain type and elevation of such tiles, but any enemy movement on it is concealed. The AI is limited by the view range of its characters in the same way, and it is well possible to hide from it or lure it into an ambush. Terrain differs in terms of the action points and fatigue it costs to traverse it. Some terrain also offers boni and mali directly applicable to combat. For example, as movement in swamp terrain is considerably slower, characters on swamp terrain also suffer from a malus to their melee defense stat. By luring enemies onto bad terrain, and making sure that your Battle Brothers are positioned on better terrain, you can give your troops a significant edge. Although the game is presented with two dimensional visuals, the battlefield has a third dimension to it: terrain elevation. Hills and hillocks can often be found on maps. The level of elevation influences how far characters are able to see, with high elevation offering increased view range and allowing to see beyond obstacles which on lower elevation would block a character’s line of sight. Higher elevation also means additional range for ranged weapons when shooting downhill. Elevation is important for melee engagements as well: attacking from high ground gives an attack bonus, and makes it more likely to hit an opponent’s head, whereas attacking from low ground gives an attack malus and makes it less likely to hit an opponent’s head. Using terrain elevation is an important tactical tool; archers are best placed on high ground, and a smaller force placed on a hill may well be able to defend it against a larger force that has to fight a literal up-hill battle. A Zone of Control is the area of one hex around any character equipped with a melee weapon, and a key concept in our tactical combat system. Any character attempting to leave a Zone of Control will suffer a free attack (basically an Attack of Opportunity, if you’re familiar with D&D) from whoever owns that zone. If the attack connects, the character is prevented from leaving the hex but still pays action points and fatigue for the movement attempt. If the attack misses, the character manages to slip out of the Zone of Control. A character can be in more than one Zone of Control at the same time – and attempting to evade multiple free attacks in order to move out of melee range can often prove deadly. With the Zone of Control we establish that characters can lock each other in melee and can’t easily disengage. Once engaged in melee, character’s can’t maneuver freely to improve their position anymore – they have to account for their opponent in front of them, attempting to land a good hit at every opportunity. When holding narrow passes, other characters can’t just run by – they can attempt to, but as they cross the Zone of Control, they risk being cut down in the process. Some of the active skills we have in the game also work closely with the Zone of Control mechanics. For example, the attack skills of some ranged weapons can’t be used while in any enemy Zone of Control (i.e. being engaged in melee range), as any opponent would be quick to strike you down as you attempted to draw your bow. Of course, this can be used by the player as well to shut down enemy archers without having to kill them. On the other hand, the “Spearwall” skill, once enabled, has the Battle Brother using it attempt to strike any opponent attempting to enter his Zone of Control and prevent them from doing so, as opposed to only strike when an opponent attempts to leave the Zone of Control. Characters are subject to morale which fluctuates based on how the battle unfolds both for them personally and for their faction. Factors that will change a character’s morale include: slaying an enemy, seeing an enemy be slain by an ally, seeing an ally fall, seeing an ally flee, being wounded and being outnumbered. With allies fleeing having an adverse effect on the morale of others, morale failure can be contagious; once the first character panics and flees, others have an increased chance to follow suit, which in turn will lead to an even higher probability of others fleeing as well. At the start of each character’s turn, if a character’s current morale is lower than their base morale, a morale check is performed (by rolling dice). If a morale check fails, that character is considered wavering. If another morale check fails the turn after, the character will panick and flee, trying to get as far away from any known enemy as possible outside of control of the player. The character may eventually rally, but only if there is no enemy in the direct vicinity. 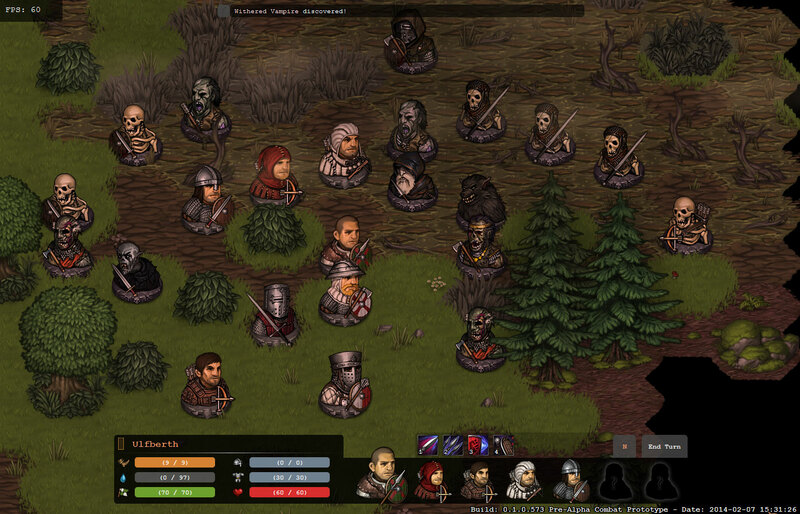 Morale affects most enemies just as it affects Battle Brothers – although some enemies, like Undead, are immune to its effects. Certain rare skills, such as of powerful enemies or rare artifacts, can directly challenge and lower the morale of targets – potentially having them flee without the need for any direct confrontation. Battle Brothers does not have a Flanking mechanic per se. We toyed around with the idea, but two points irked us: A combatant in real life can turn around in a split second, so determining that any combatant would be attacked from the back only for the fact that he couldn’t turn around because it isn’t his turn currently seemed very artificial. Second, it would require a very clear indicator of what direction any character is currently looking at – in other words, we would have needed character busts for every one of six possible directions. Sadly, our resources are very limited, and we’d rather spend them on more important things. What we came up with instead is the Overwhelm mechanic. The more individual characters attack any defending character in close combat within a single round, the easier it gets for them to score a hit. Or in other words: We’re granted a to-hit bonus for each character that attacked our target previous to us in the current round. This way we simulate the difficulty of defending against multiple opponents that attack from multiple sides without the need for any fixed character headings. Characters equipped with shields have moderately increased defense against both melee and ranged attacks, or in other words, they have a reduced chance of being hit. They also gain access to the “Shieldwall” active skill – when using it, their defense is further increased by a significant amount. In addition, they gain a small boost to their defense for any ally adjacent who also uses the “Shieldwall” skill, simulating that several combatants can interlock their shields to form a sturdy shieldwall, viking style. Since to make full use of a shield, an active skill has to be used, the player (and for that matter, the AI) has to balance whether passing on an additional attack in favor of a defensive skill is the right move in the current situation, or whether going full-on offensive might be the better choice. Shields, especially with their active skill, are a powerful tool in melee battle – but there is a way to get rid of them. Certain weapons, like all kinds of axes, grant their wielder a “Split Shield” skill. Depending on the type of shield and weapon used, a few hits with this skill can make short work of any shield. Still, as with the “Shieldwall” skill, any attacker has to balance whether trying to destroy the shield now in order to make any further attack easier to hit with is worth it, or whether it is a better option just trying to pummel the defender with attacks in the hopes of one of those attacks getting through. 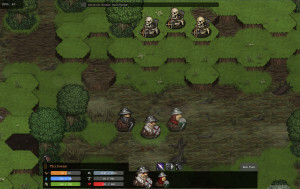 As with any combat mechanic, this applies to both the player and the AI – so sending a Battle Brother with a shield against an axe-wearing skeleton could well mean that you’re about to have one shield less. Characters can have any number of status effects depending on their equipment, the terrain they stand on and attacks they suffer. For example, a character can be stunned after being hit by a blunt weapon – while being stunned, the character will be unable to act on his turn (but will still attempt to defend itself when attacked). There are two hitzones that each attack can hit: body and head. It is much more likely for any attack to hit the body, but a hit to the head does increased damage. In fact, a hit to the head is somewhat akin to a critical hit in other games, but we flattened the curve; it is more likely to hit the head than do a critical hit in other games, but conversely the damage increase isn’t as great as in other games. 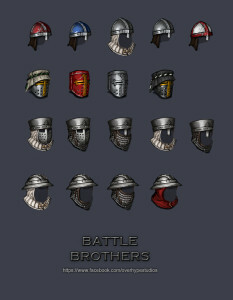 In addition, since there are separate armor pools for body and head, the player can choose to equip Battle Brothers with helmets to protect against hits to the head. Some weapons and some skills also make it more likely to score a hit to the head, so this is something the player can somewhat control and that isn’t entirely random. Hitpoints are modeled pretty straight forward – there is a single pool of hitpoints, and if that ever reached zero, the character dies. There are two pools of armor points (for body and head). On an incoming hit, the respective armorpool gets reduced until it reaches zero, at which point the armor is discarded and useless for the remainder of the combat. Only then can hitpoints be lost. In other words: Armor works as a kind of extra hitpoint buffer divided into two hitzones. 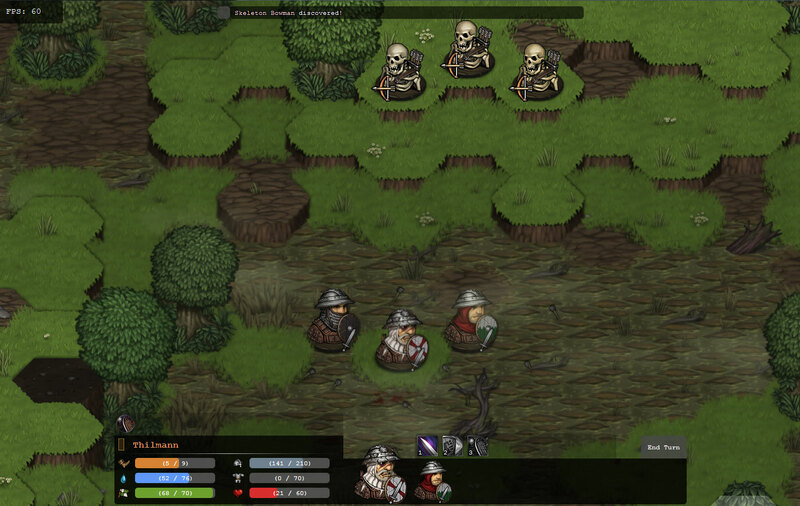 Attacking an opponent in Battle Brothers always means using a skill – there is no anonymous basic attack. Since active skills are determined by the equipment worn there is some variety on what skills individual characters have at their disposal. Using the one-handed longsword as an example, the wielder is granted the “Slash” and “Riposte” skills. “Slash” is a basic attack dealing average damage to a single target with an above-average to-hit chance. Its action point and fatigue cost are so that any character can perform at least one slash a turn, no matter how fatigued they are. Normally, a Battle Brother can perform “Slash” two times a turn, or one “Slash” and one “Riposte”. “Riposte” on the other hand, is a more specialized skill. When activated, no target needs to be selected, but the character will for one round automatically perform a counter-attack on any opponent that attempts to attack him and misses. With “Riposte”, a character can potentially do much more damage than with a single “Slash” – but this comes at a price; any opponent would first have the chance to hit that character, and the fatigue cost is substantially higher, so that “Riposte” can only be used a few times in succession. With “Riposte”, our goal was to capture the sword-fencing idea of feints and counter-attacks in a more defensive skill. Other weapons have more offense-oriented special skills – such as the “Split Shield” skill of axes which you already learned about. While one-handed weapons allow for two attacks a turn, heavy two-handed weapons only allow for one – but one that will definitely be felt if it connects. The skills, and our thoughts on developing them, are a complex topic on their own and perhaps warrant their own future article. Will there be any healing potions/packs? I didn’t notice any in the video for update #11. What about buffs and debuffs? Finally, will any of my battle brothers be able to cast spells or use magic? Healing: Right now there is no way of healing your Brothers in the midst of battle right away. Healing, like in the classical X-Com, will happen outside of combat. However, there may be unique items that grant special skills that can actually heal a brother in combat. These items wont be healthpacks or potions however and they wont be very common. There will be no classic “spells” in the game but there will be some magicaly items like amulets and such that grant similar unique skills. We will show more of these items in the future. However, right now we are not planning on introducing any fireball-throwing mages or anything of that kind.